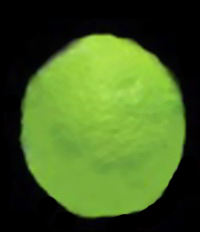 This is a type of an Indian orange but is unripe and green in colour for pickle. In some part of Tamil Nadu, it is also called “koLanjikkAi, kaDArangAi, Kasappu nArttangAi etc.” KaDArangAi and Kasappu nArttangAi have yellow skin but the former has thick skin and a bit sour while the latter has thin skin but bitter with a little sour taste. Wash and clean the nArttangAi with a dry cloth. After a few minutes when it is not wet, take a little salt in a vessel and cut it into small dices of about ¼ inch and put it in the vessel. Remove the seeds. Whenever you prepare pickle and use your hands ensure that they are not wet but dry and clean. Add the red chilli, pre roasted fenugreek powders, turmeric, asafoetida powders and the remaining salt and mix well. Store it in a jar closing air tight with a lid. Keep it in a cool place well lit. Once in a while, toss the contents. This is stock. Whenever you want to use it for curd rice, take a little of it using a ladle (preferably wooden one) and then season it with mustard seeds using white sesame oil. 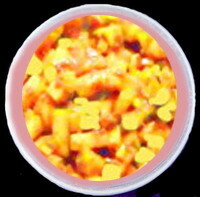 As in the case of mango, here also there is another way of preparing this. In this method, only the salt and turmeric powder are mixed with the pieces and then they are kept in a jar with an airtight light lid as stock. Whenever you want to use, you can take a little of this and then add the required quantity of red chilli powder, fenugreek powder, asafoetida powder and season with mustard seed. This pickle will have fresh taste and aroma. In this way you can prepare koLanjikkAi, kaDArangAi and Kasappu nArttangAi pickles stock and use after seasoning the required quantity for use. Pickle prepared in this way will last for more than a year. Some people sauté red chillies (about 10) and fenugreek in a little til oil, and after it is cooled, grind into coarse powder. 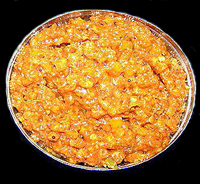 This powder is mixed to the cut pieces with salt, asafoetida powder and turmeric powder. Thereafter, it is seasoned with mustard seeds. I have tried this pickle using unripe green musambis also but it takes a little longer time to become softer. But in this pickle since musambi has little juice, we have to add lemon juice extracted from 6 lemons for 4 musambis. This is prepared for conceived mothers who should not take chilli powder for at least 3 months as well as for convalescing patients. The fruit is washed and cleaned as usual and then cut in the form of a spring with rings. These are placed over a little salt. 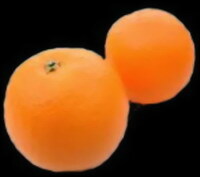 The seeds can be removed or retained to be removed when using. To this, 1 tsp of turmeric powder and ½ a cup of salt are added for 4 fruits and then tossed well to enable the ingredients smear the rings homogenously. After 3 days, only the rings are taken and dried in the sun. In the evening again they are put back in the jar in the oozed liquid. This way daily they are taken out and dried in the sun for about 7 days or till the entire contents of the jar are completely dry. Store in the jar with an air tight lid when they are completely dried. 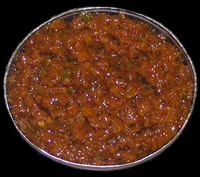 You can prepare instant nArttangAi pickle following the same procedure mentioned for instant lemon pickle, discussed earlier. Wipe the skin and clean with a dry cloth. Remove the fibres from inside the skin. Cut into very small pieces. Cut green chillies into very small pieces and add. Extract juice from the lemons and add. Add the salt and turmeric powder. Mix well and store it in a jar closed with an air tight lid. Toss with a spoon or small wooden ladle occasionally. After 7 days it will be ready to use. Take quantity required and then season it with red chilli powder, mustard seeds, asafoetida and fenugreek powders. In case the pickle before seasoning is not softened and tastes bitter, add a little more salt and lemon juice and allow these to be absorbed for another 4 days before use. Wipe the skin and clean with a dry cloth. Remove the fibres from inside the skin. Cut into very small pieces. Cut green chillies into very small pieces and add. Extract thick juice from the tamarind and add. Add the salt and turmeric powder. Mix well and store it in a jar closed with an air tight lid. Toss with a spoon or small wooden ladle occasionally. After 5 days take oil in a kaDAi and when hot add mustard seeds. When it splutters add the orange skin stock with jaggery and sauté well. If you feel it needs to be a little hotter, add some chilli powder before sautéing. Sautee till it leaves the side. Put off fire and allow to cool. After some time when still warm add the asafoetida and fenugreek powders and mix well. When cooled refrigerate in a jar. It is good to use with plain rice or curd rice. 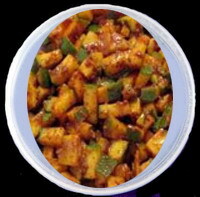 This entry was posted on January 21, 2012 at 10:03 pm and is filed under Indian Pickles with tags asafoetida, fenugreek, green chilli, Indian pickles, instant narttangai pickle, jaggery, kadarangai pickle, kasappu narttangai pickle, lemon, mustard seeds, narttangai pickle, orange skin pickle, orange skin puli tokku, pure white sesame oil, red chilli powder, red chillies, refined oil, salted narttangai, table salt, tamarind, til oil, turmeric powder. You can follow any responses to this entry through the RSS 2.0 feed. Both comments and pings are currently closed.